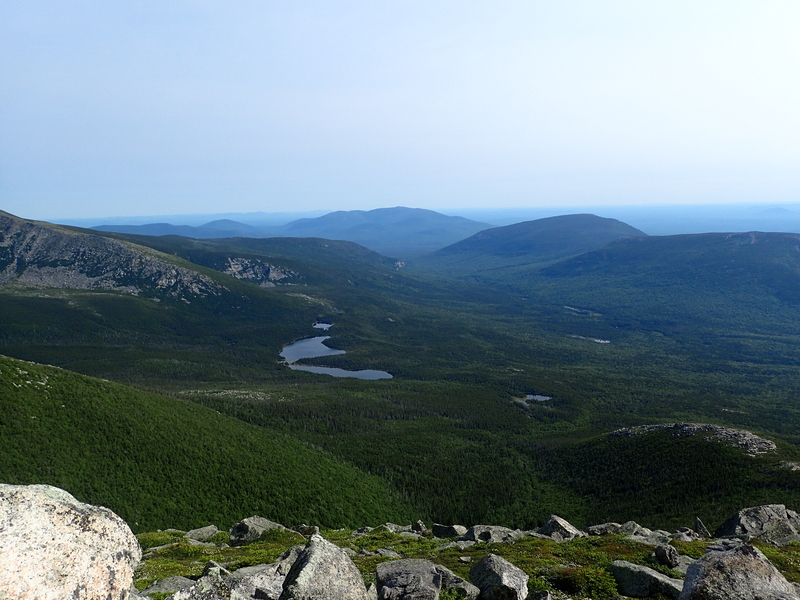 This post is a continuation of the last trip report I posted for Acadia National Park, and made up the last day of my 4th of July 2015 trip to Maine. After enjoying our delicious lobster rolls in Bar Harbor we made the roughly 2 hour trip north up to Millinocket, Maine which sits just outside the state park. 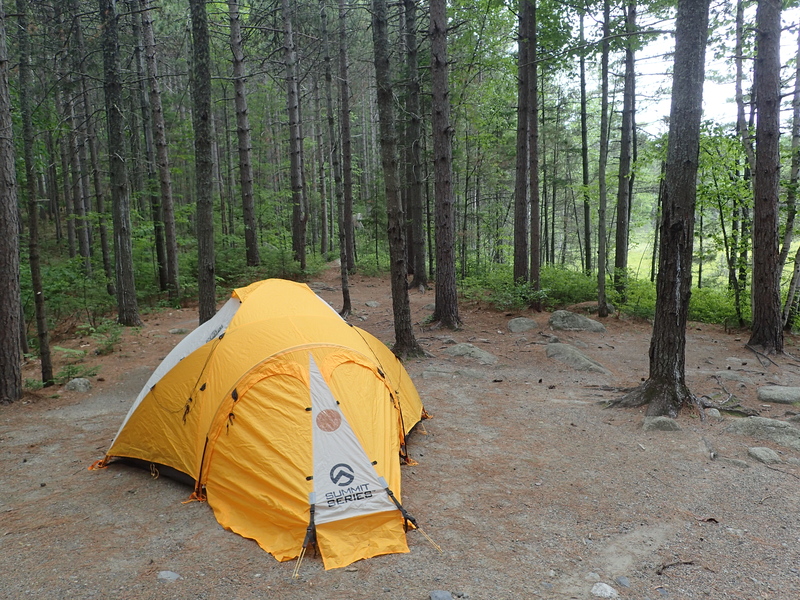 We were camping at the Big Moose Inn campground which is only a few miles from the state park entrance. I would have preferred to camp at the park but spots are extremely limited and the holiday weekend certainly didn’t help. I had actually tried to reserve a spot roughly a month in advance but that still wasn’t long enough. The Big Moose Inn was a functional spot to stay, but offered only basic amenities for campers. It wasn’t a campground I particularly liked but our spot was nice and quiet which made up for it. The only over arching theme to this particular part of the trip would be the bugs. The amount of mosquitoes throughout the trip in this part of Maine were astronomical. I certainly expected them to be bad but it was so much worse than anything I had experienced before in the Adirondacks or White Mountains. In the time it took us to get the tent set up I got at least 6 or 7 bug bites WHILE wearing bug spray. In Acadia there were hardly any bugs at all so this was a bit of a change of pace. In the end the bugs were just a minor annoyance and we settled in for the night because we knew we would have to get a very early start the next day for our hike to Katahdin. 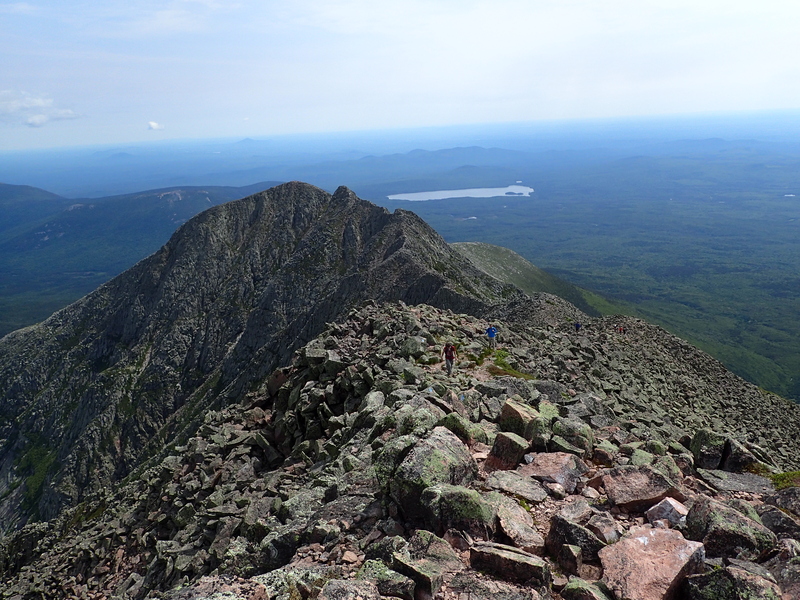 Luckily prior to arriving in Maine I did a good bit of research on climbing Katahdin and it was a good thing I did. 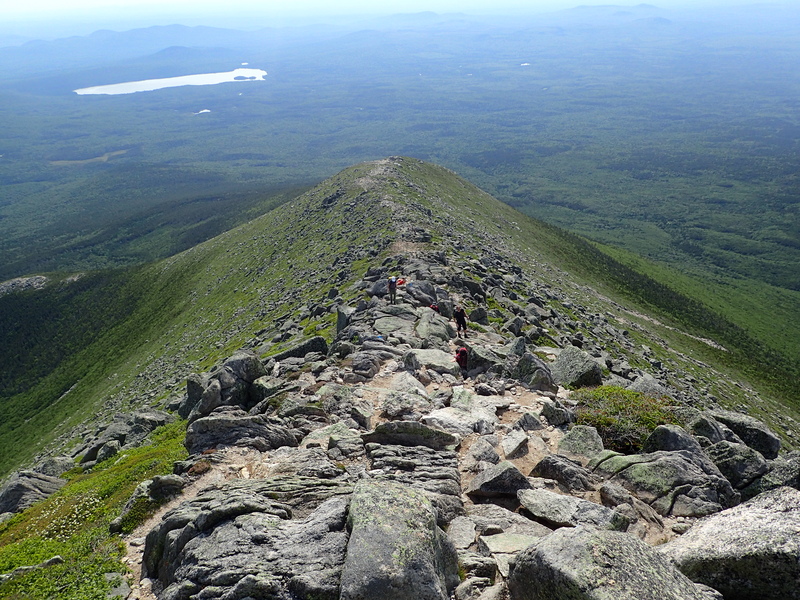 Climbing Katahdin has a fair bit of red tape which is important to keep in mind prior to arriving at Baxter State Park. The main issue is that the park strictly limits how many people they let in to each trail head within the park, so in other words if you are not there early enough you may not be able to do what it is you wanted to do. 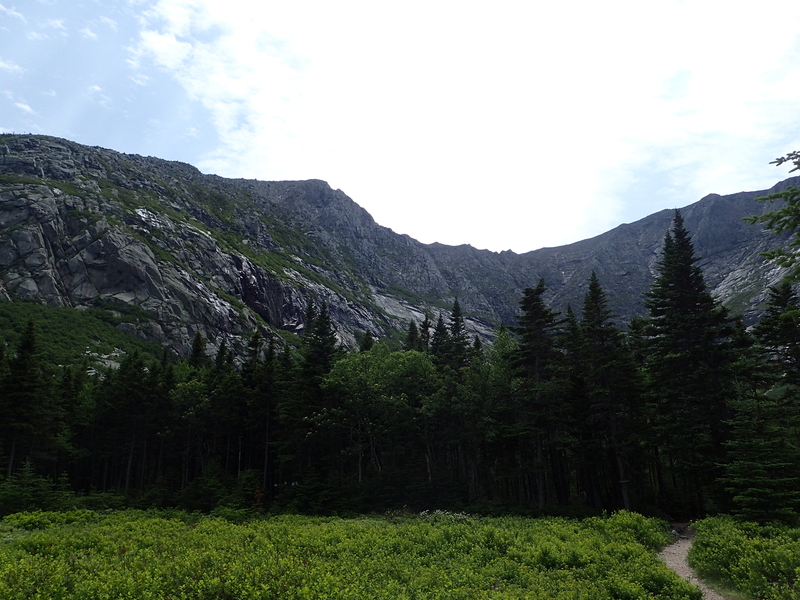 The Roaring Brook trailhead which is used primarily to climb Katahdin, the Cathedral trail, Pamola, and the Knife Edge is by far the most popular trailhead in the park. With that being the case I knew we had to be there bright and early to ensure we didn’t have any problems at all getting in, especially since it was the 4th of July. We woke up bright and early at 4 am for the second day in a row and got ourselves dressed and ready to go. We were in the car within a few minutes and on our way to the park entrance. Baxter State Park has a gate blocking the entrance and once we arrived at 4:30 am we were actually the second car in line to get in. We settled in to wait until 6 am when they would open the gate and begin letting us in. By the time the park employees showed up to open up at 6 am there were roughly at least 12 more cars lined up behind us. I felt pretty happy that we made the right decision to be there so early. Once inside the park it is another 8 mile or so drive on a dirt road to the actual parking lot and trailhead. Once we arrived there we took our time getting ourselves organized and ready for the rest of the days hike. Since the hike isn’t terribly long in terms of mileage we didn’t feel the need to rush. By about 6:30 am we were all signed in at the trail head and on our way. 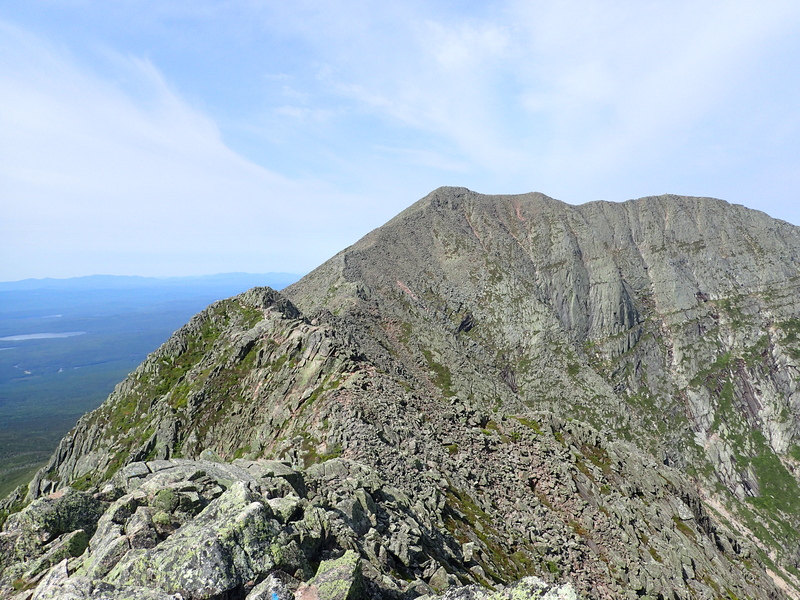 We had decided to hike the loop starting with the Helon Taylor trail which climbed Pamola Peak first before climbing up the Knife Edge and over to the summit of Katahdin. 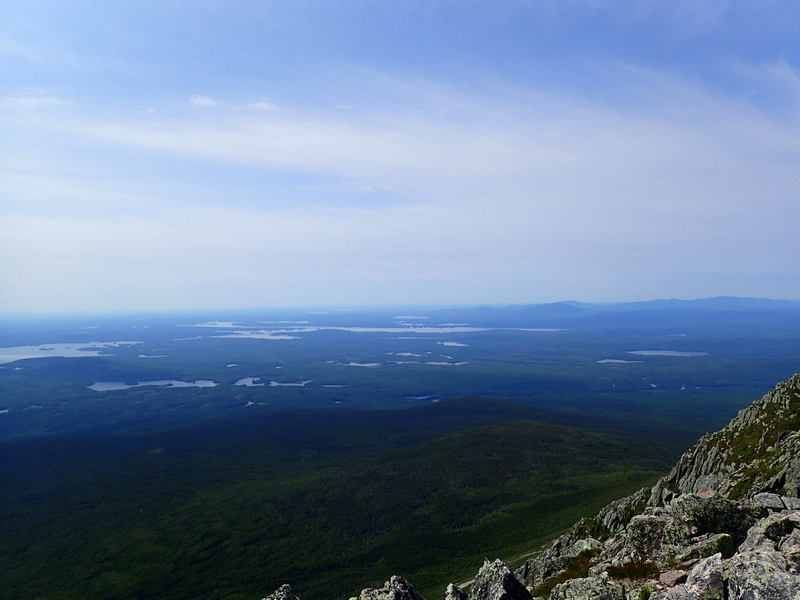 After reaching Katahdin we intended to hike the Cathedral back down to Chimney Pond and out to the parking lot. This plan worked but in retrospect I think it would have been better to do it the other way so it would be more fun to enjoy the scramble up the Cathedral trail instead of simply walking down it. Once we were on the Helon Taylor trail heading up to Pamola it was smooth and easy sailing. The trail is in quite good condition and has a fairly moderate incline for most of the way. I was also happy there was little to no mud anywhere, a nice change of pace from what I am used to in the High Peaks of the Adirondacks. Once getting a bit higher on the trail there was a bit of scrambling required before reaching the ridge proper. None of this was difficult but did make the trail much more interesting. 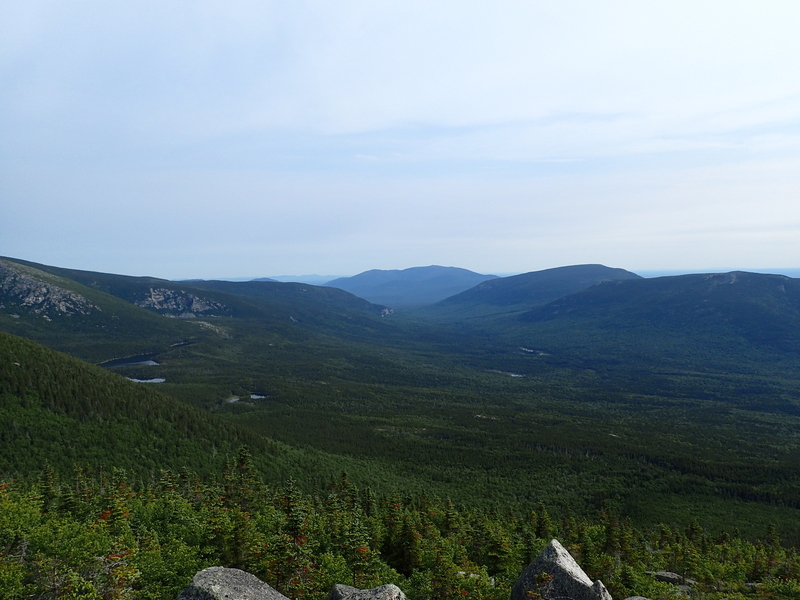 Being so far north it didn’t take too long until we were climbing above the treeline and could enjoy the beautiful views in all directions. As far as the eye could see there was nothing but beautiful wilderness full of mountains, ponds, lakes, and trees. 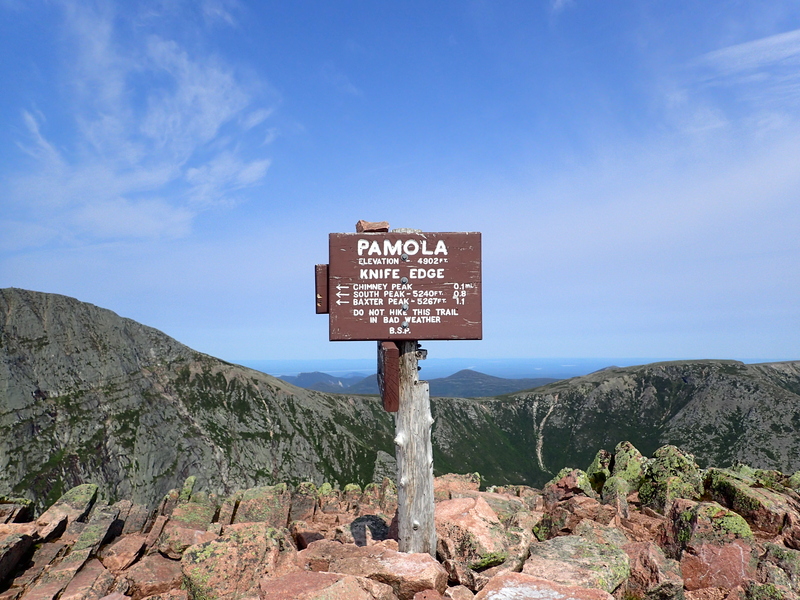 Once above the treeline the trail follows a ridge straight up to the top of Pamola peak. 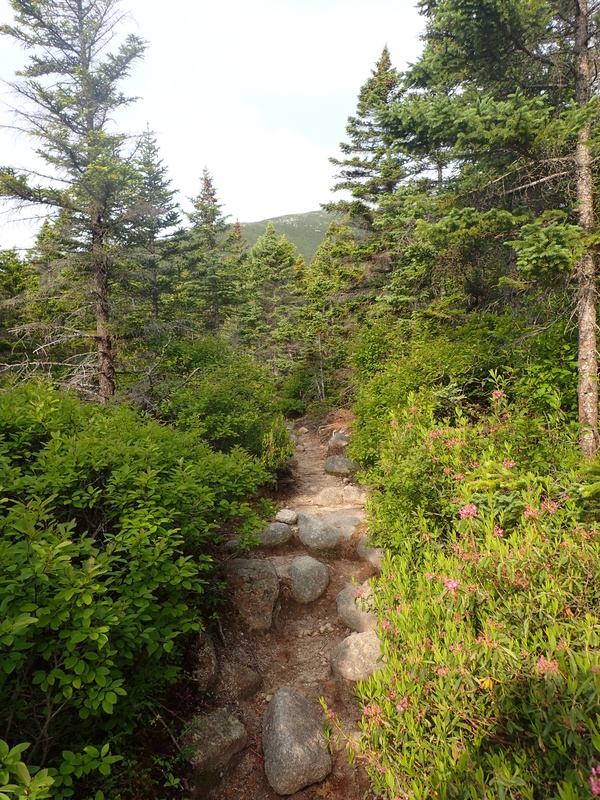 This trail is easy to follow and well marked and has a moderate incline almost the entire way. There is only one section which has a bit of fun scrambling followed by a talus field near the top. The bugs up until this point had not been a major issue but once we were above treeline there was a near constant swarm of them buzzing around out heads. They weren’t really biting but they weren’t leaving us alone either. It got to the point that even on the drive home we could still hear and feel them buzzing by our heads! The views only continued to get better and better as we made progress up the ridge to Pamola. We couldn’t have asked for better weather for the day and we reached the summit of Pamola in no time, and even passed all of the groups that had checked in ahead of us that day. Once we reached the summit of Pamola we were greeted by the most dramatic views I think I have seen anywhere in the Northeast. It is hard to find the words to explain the feeling you get when you see the rocky mountainous landscape in front of you. 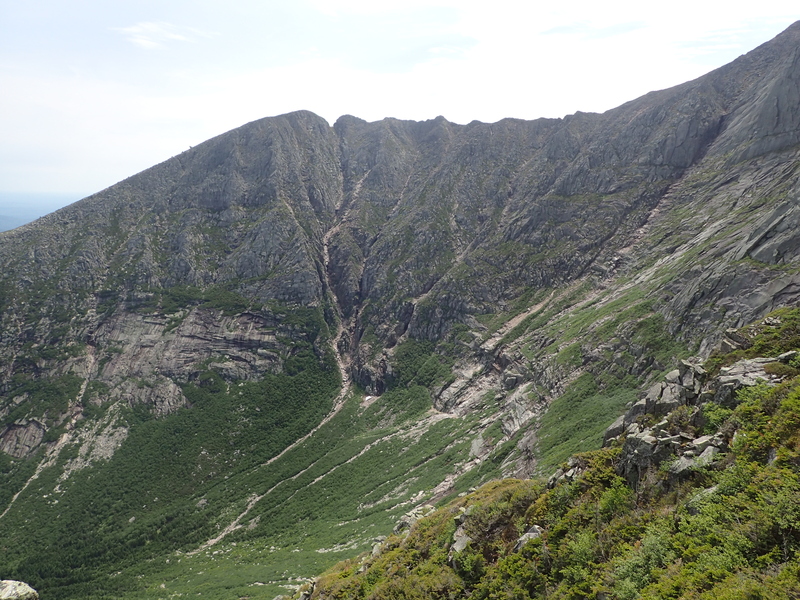 We also got our very first look at the famous Knife Edge and couldn’t wait to get started on it. The wind on this day was pretty mild and we were plenty comfortable up on the ridge only wearing shorts and t-shirts. The first part of the Knife Edge trail I think is technically the hardest as it involves a steep climb into and out of a chimney that separate Pamola from the rest of the ridge. It is not particular dangerous but it does require care when negotiating. Once on the Knife Edge proper the real fun starts. The trail is only a few feet wide in spots and you get a great sense of exposure on either side of you. Along the ridge their are spots where only a couple of feet separate you from 100-1000 ft drops into the valley below, but have no fear it is really quite secure and 1000’s of people have hiked this trail. 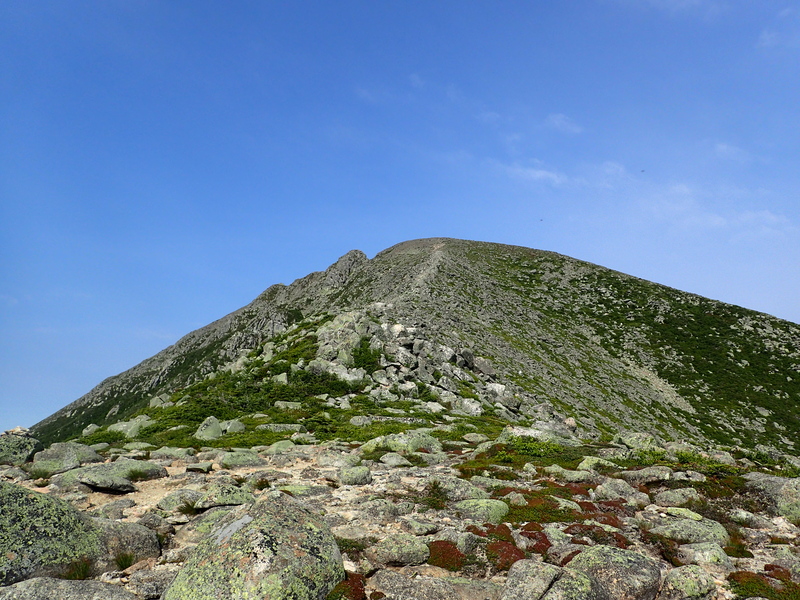 The trail itself is not technically difficult and involves only scrambling but it is important that you are very aware of wind and weather conditions and do not attempt to cross the ridge in bad or windy weather. Also once on the Knife Edge there are brilliant views of the surrounding landscape in all directions. The trail is easy to follow and the blue trail blazes mark the route over the ridge. In certain locations the trail will take you down along a ledge on the side instead of directly on top of the ridge itself. The markers are easy to follow and show the safest and easiest way over. The traverse over the Knife Edge unfortunately was over much too quickly but it was really quite the highlight and exactly what I was looking for out of this trip. 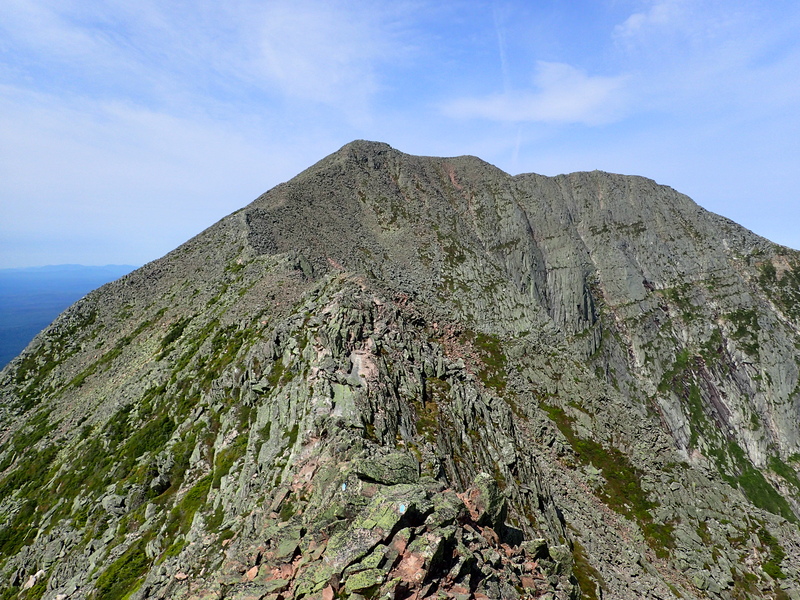 Once you finish the Knife Edge you will find yourself at a big cairn marking the summit of South Peak at 5,260 ft. 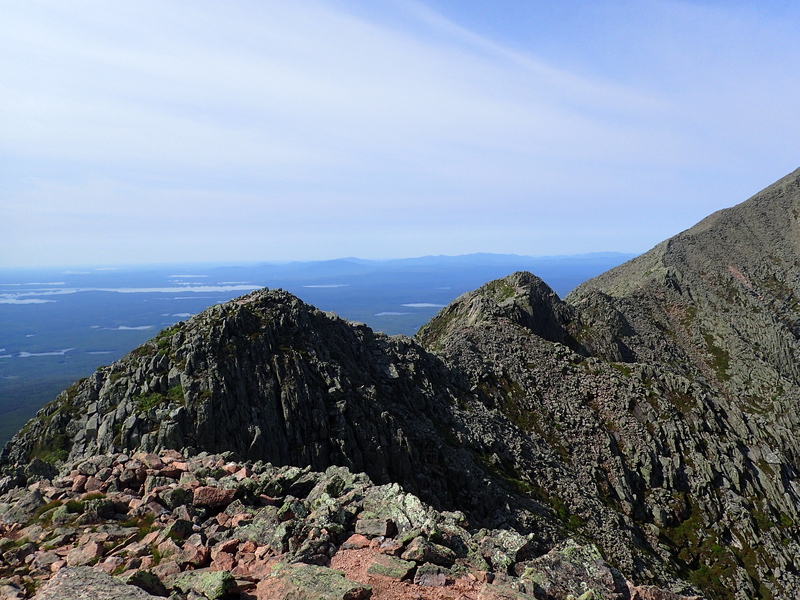 It is a short traverse over to the summit of Katahdin from here over large talus and boulders. 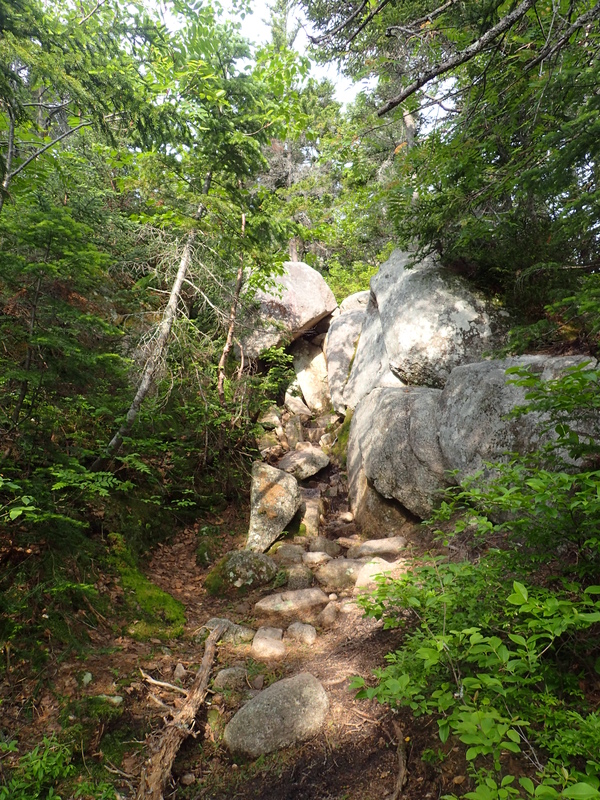 There is no real “trail” but the path over the boulders is easy to follow. Besides at this point you are likely to run into other people doing the loop from the opposite direction. 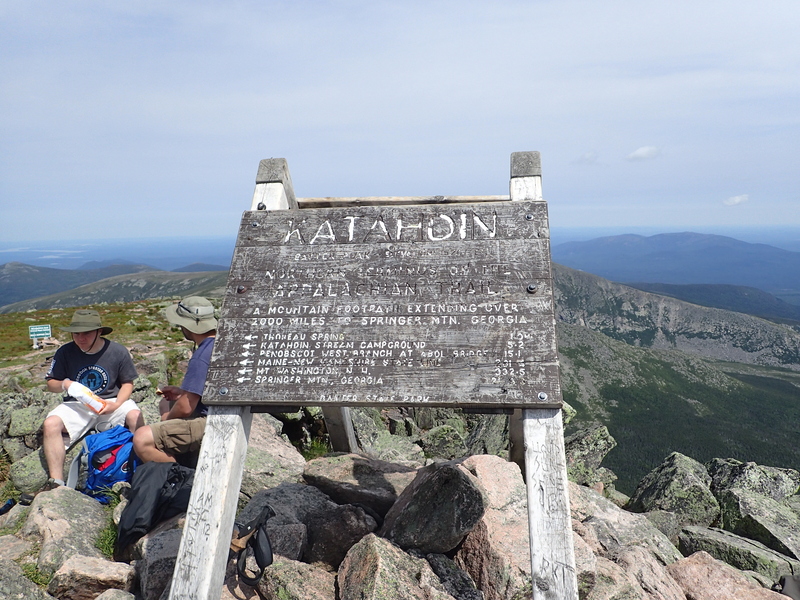 Shortly there after we made it to the summit of Katahdin, the northern terminus of the Appalachian Trail. We spent about 20 minutes hanging out on the summit and taking pictures. It was a pretty busy day with quite a few people enjoying the 4th of July on the summit. After we finished up relaxing on the summit we got on our way back down. We headed towards the Cathedral trail and passed quite a few people on their way up. It seems like almost no one used this route as a descent because everyone seemed quite surprised we were crazy enough to want to descend that trail. I think some of them even looked at us with genuine concern given that it was a fairly steep trail. However, we both were seasoned rock climbers with plenty of hiking experience so we figured we could manage just fine. In the end it was in fact steep but not difficult. 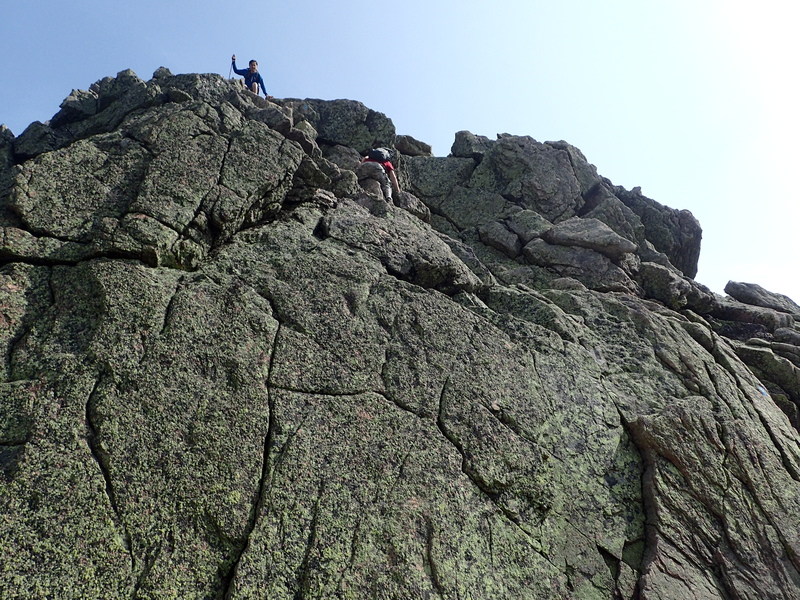 I was more bummed out that we didn’t climb up it as the scramble would of been more enjoyable in that direction. Going down such a steep trail is really more boring than fun. However the views from this direction were really quite incredible. Once we reached the bottom of the Cathedral Trail we had the trail to ourselves and didn’t see anyone else until we were nearly back to the parking lot. 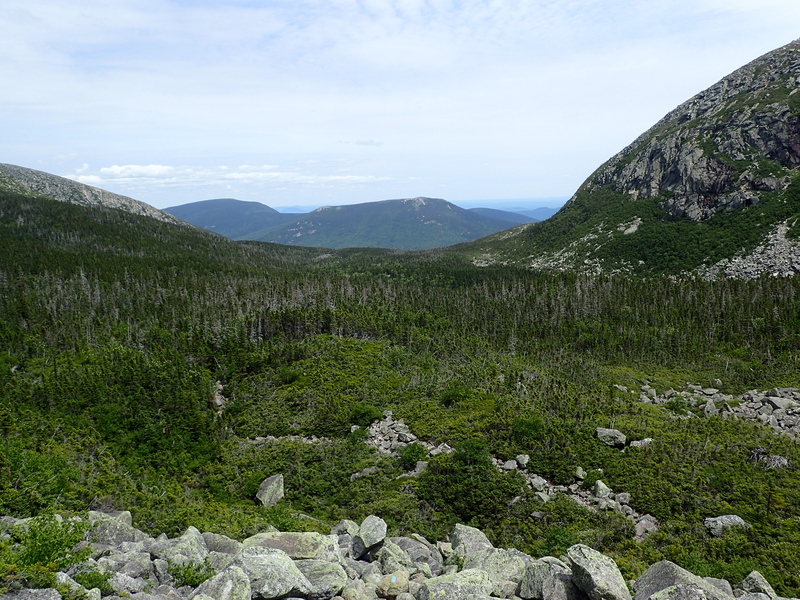 Once we got back down below the treeline we headed towards Chimney Pond and made good time on the fairly flat and easy trails. 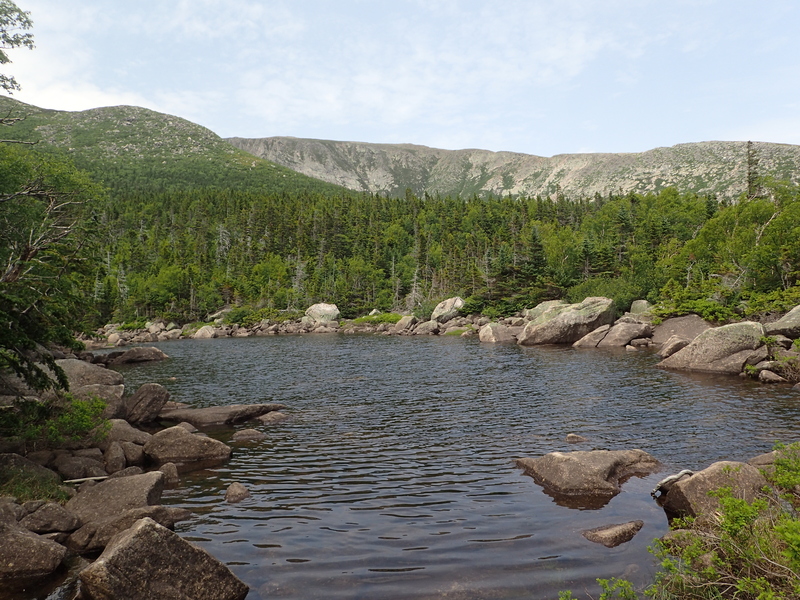 Chimney pond is a beautiful little clearing and camping area that I hope to one day come back to stay at. The views from this location are really top notch. On the way out we also passed more ponds and streams which were a nice refreshing stop on a day with so much heat and bugs. We were really hoping that we might see a moose at some point in the distance by one of these ponds but unfortunately we weren’t so lucky. We made it back to the trailhead by around 2 pm in the afternoon having made really great time up and down the mountain. Luckily we got in early as the parking lot was filled to capacity and even bursting at the seams. After settling in we got back in the car and headed back to the campsite. Since we had finished so early and the next days weather looked very bad we decided to pack up our stuff and head back to New Jersey early. In the end it was an excellent trip and I can’t wait to make it back in the winter! 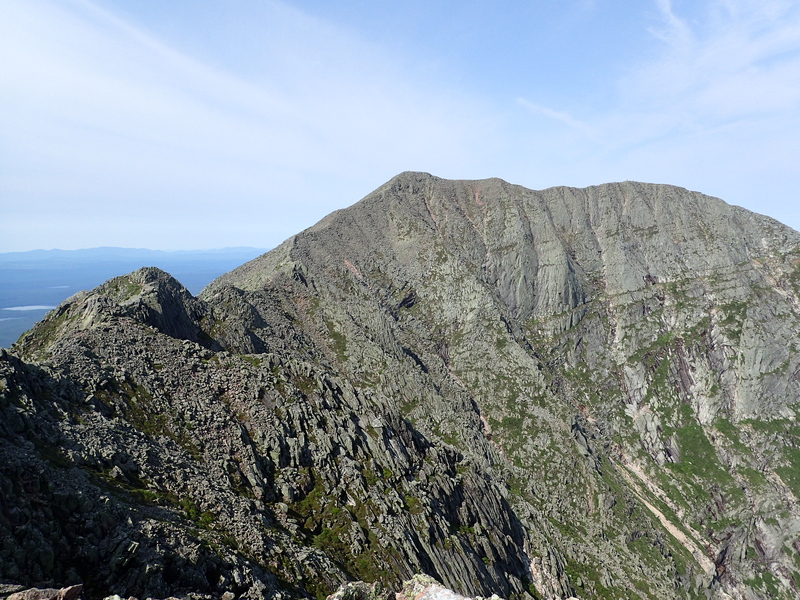 The first time I climbed Katahdin was November 2010. I remember the same elation. Nice post! Thank you! It really was an incredible place I think everyone should try and see if they can. I’m looking forward to heading back for a winter ascent. That will certainly be epic. I attempted the Presidential Traverse in the winter too, but didn’t pull it off. Too much trail breaking for the amount of time my friend and I had. However, if you’re climbing around in the Whites, do the presi traverse in the summer! I would love to do it in winter or summer, its been on my to do list. Were you guys on skis or just hoofing it? I have been up Washington 3 times but never any of the others in the traverse. Attempted it on snowshoes… got socked in a Madison summit on the first day, and made the call the next day not to finish it due to time constraints. About 10 below that night at elevation, and winds on Madison summit were burly. Sounds about right from what Im used to up there. Last time I was on Washington in winter we summited in 60+ mph sustained winds. We were the first ones breaking trail too. Was a nice work out. Of course on the way down the wind stopped! I was thinking it may be easier to do the traverse in skis but I havent researched it much. Are you local to the area?